Ouachita Baptist University is pleased to announce a new degree program: the Bachelor of Science in Nursing degree. Answering nationwide calls for innovation in health care education and more baccalaureate-level nurses, this new degree pairs the strengths of Ouachita Baptist University with the strengths of Baptist Health College Little Rock. Ouachita is a nationally ranked liberal arts college founded in 1886 with a mission of fostering a love of God and a love of learning. And Baptist Health College Little Rock is a recognized leader in health care education since 1920 and an integral part of Baptist Health Medical Center-Little Rock and Baptist Health, the largest health care system in Arkansas. Through this innovative partnership—a dual-enrollment RN-to-BSN completer program—you will have the opportunity to earn the Associate of Applied Science in Nursing degree from Baptist Health College Little Rock and the Bachelor of Science in Nursing degree from Ouachita Baptist University, all within four years. It’s an exciting time to be a student at Ouachita. Join us! You’ll be a full-time Ouachita student throughout all three phases, while dually-enrolled at Baptist Health College in Phase 2. After successful completion of all requirements at BHCLR, you may apply to sit for the National Council Licensure Examination for Registered Nurses (NCLEX-RN) to be eligible for licensure as a Registered Nurse. Once you’ve passed the NCLEX, you’ll be eligible to complete your BSN requirements in Phase 3. As a Nursing student, will I have opportunity to be a “regular” Ouachita student, taking part in all aspects of campus life? During Phase 1, you’ll be in residence on Ouachita’s beautiful campus in Arkadelphia, in the foothills of the Ouachita Mountains. You’ll live with your fellow students in a residence hall, sharing the joys and challenges of college life, establishing relationships that will last a lifetime, and growing academically, socially, and spiritually. At Ouachita, you’ll discover a rich academic environment. You’ll know your professors and they’ll know you—your hopes for the future, your sense of calling or purpose, and your unique gifts and capabilities. 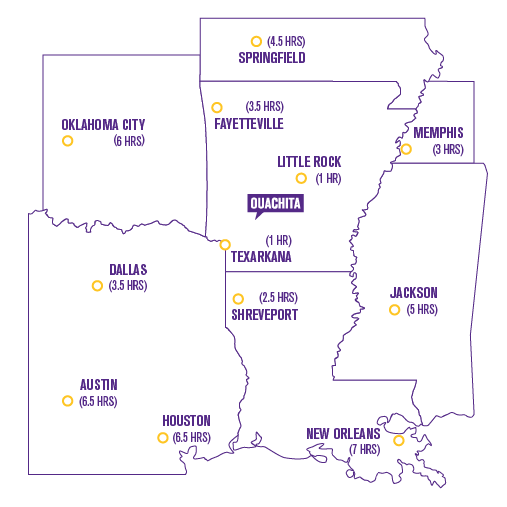 With the University’s exceptionally low student/faculty ratio of 12:1 and its focus on undergraduate education, you’ll benefit from personal attention, accountability, and encouragement, all factors which contribute to Ouachita having one of the highest graduation rates among all colleges and universities in the state. Because of Ouachita’s steadfast commitment to its mission as a Christian university, you’ll find an authentic and Christ-centered community that will nurture you spiritually. Your character and faith will be strengthened by the people who surround you—friends and mentors you will lean on, learn from, laugh with and love. What about student life outside the classroom? From playing intramural sports in our nationally recognized RecLife program (or even claiming a spot on one of Ouachita’s 12 NCAA Division II intercollegiate squads if you have the skills); to entertaining thousands in Tiger Tunes; to accepting an invitation to pledge one of the University’s nine social clubs; to weekly worship in Chapel and at Campus Ministries’ student-led Refuge service; to participating in any of Ouachita’s 40-plus organizations, leadership, and service opportunities…you’ll be an active part of Ouachita’s extraordinary outside-the classroom experience. Tired yet? Trust us, you will be! In Phases 2 and 3 of your degree program, you’ll be singularly focused on Nursing. Nevertheless, we’ll likely see you around Ouachita’s campus when you need a break from your BHCLR coursework and clinicals. You’ll be a Tiger for Life, after all, and there’s just something about Ouachita that keeps us coming back. Schedule a visit to campus and see if you feel it, too. Will I be eligible for Ouachita’s scholarship programs? During your residency in Phase 1, yes you will. For an estimate of the scholarship award you will receive when you enroll, check out our Net Price Calculator and Scholarship Calculator online at www.obu.edu/finaid. In Phases 2 and 3, you’ll not receive Ouachita-funded institutional financial aid since your costs will be significantly reduced. Talk with your Admissions Counselor (870.245.5110) to better understand the exact costs you’ll encounter. We’re confident you’ll agree that a BSN from Ouachita Baptist University is a great value. Will I have help finding a job after I finish my BSN degree? Yes, both BHCLR and Ouachita will provide job placement assistance to you. Although the final responsibility for landing employment will be your own, graduating from a dual degree program with the exemplary reputations of both Ouachita Baptist University and Baptist Health College Little Rock, you can be confident in your prospects post-graduation. May I continue to receive other scholarships, grants, and loans when I begin the Phase 2 pre-licensure courses and clinicals at Baptist Health College Little Rock, and later in Phase 3? If you qualify for a Pell Grant, Arkansas Academic Challenge, student loans, parent loans, or other private scholarships, the funding will be processed by Ouachita and applied to your student account just as before in Phase 1. Although eligibility for Ouachita-funded institutional aid ends in Phases 2 and 3, BHCLR offers a variety of Baptist Health Foundation Scholarships and you will be eligible to apply for these scholarship funds during Phase 2. How long will it take me to complete Ouachita’s Bachelor of Science in Nursing degree? It’s easiest to show you a year-by-year progression toward your degree. During your Phase 1 residency at Ouachita, you’ll be eligible for the University’s scholarships and financial aid support. In Phase 2, instead of Ouachita’s regular tuition, fees, and room and board charges, your costs will be substantially reduced as you pay only the Ouachita Online tuition (less than $1,000/semester) and Baptist Health College tuition (currently less than $6,000 per semester). Ouachita-funded financial aid is not available after Phase 1, but the reduced costs will minimize your out-of-pocket expenses. Phase 3 costs will be limited to Ouachita Online charges, projected at less than $5,000 for the semester. And, you’ll continue receiving throughout Phases 2 and 3 any federal, state, or other private aid you were awarded—such as a Pell Grant, Arkansas Academic Challenge, and student or parent loans—as long as you meet continuing eligibility requirements and conditions. Still concerned about costs? Factor this into the equation: Unlike most BSN degree programs, after successful completion of all requirements at BHCLR, you will apply to sit for the National Council Licensure Examination for Registered Nurses (NCLEX-RN) to be eligible for licensure as a Registered Nurse. If successful, you may choose to pursue the option of working as a Registered Nurse while enrolled in your final BSN coursework through Ouachita Online. Experience a glimpse of the campus life we get to live every day at Ouachita!